This is the third time I have had the privlege of staying at this wonderful apartment in my favorite city of Venice Italy. I like the courtyard. I like that it has everything. I like the comfortable beds. I like that the bathroom is large and modern. I like the fact I don't have to go up a bunch of stairs after a day of sightseeing. I could live here and be quite happy. I like how you wrote out instructions for me, more than once, when I needed them, once in Italian for the train station. Thank you for everything. We wanted a true Venetian experience and this apartment's location and character delivered this for us.You can walk to the main sites from here or you are located between two water bus stops both within a few minutes walk of the front door.Jackie's very helpful electronic map highlights a number of good local restaurants and bars as well as others in the city and is a great aid to planning where to to eat and drink whether locally or further afield.We never needed to venture to far at night as we found the local bars and restaurants ,all within 5 minutes walk ,perfect for us and as we didn't get to sample them all have resolved to return in the near future. Dorsoduro is a really authentic Venetian neighborhood that has all you might require to enjoy your stay in Venice and the apartment is located in a very quiet and safe area, we will return. We stayed at Ca Venexiana for 4 nights and really enjoyed it! We loved being in the Dorsoduro neighborhood away from the summer crowds in St. Marks. Despite being off the beaten path, it's a short walk to many restaurants and Vaporetto stops that transport you easily to the tourist destinations. The apartment itself has two comfortable bedrooms, a small kitchen and cheerful living room, but the star of the apartment is the beautiful patio. When you open the big wooden doors, it looks out on a peaceful part of the canal. The owner is easy to work with and offers lots of great suggestions for local restaurants, activities, markets and wine shops. This is a great home base for a trip to Venice that makes you feel less like a tourist and more like a resident. I stayed at Ca Venexiana for three nights with family and it was wonderful. We were met at the Vaporetto station by one of the caretakers who walked us to the apartment. He took the time to point out the local grocery store as well as some restaurants and made recommendations on things to do. The apartment was very clean and had everything you could want and more. The best part, the small patio which overlooks one of the canals. In fact, there were canal views from both bedrooms and the kitchen. It was such a delight sitting outside, enjoying a glass of wine, and watching the boats and gondolas go by. The beds were quite comfortable as well and there was AC and wifi which was great. We will absolutely be back! Three of us stayed here for a wonderful week. The apartment is so comfortable and pretty. The terrace is so great -- really the reason I booked it, knowing my Mom would love it, and she did. So many things added to make our stay perfect: an espresso maker, a computer, lots of current converters, and even extra-large umbrellas. We communicated with the owner twice during our stay, and she responded quickly. And the location is wonderful -- Dorsoduro is active and lively, but away from the crazy crowds. I would absolutely recommend booking this beautiful apartment! Ca' Venexiana was the perfect place to conclude our honeymoon in Italy. Thank you for sharing this lovely nook in Venice. It's by far the best flat during our trip; we only wish we'd stayed longer. Please don't change a thing. We'd love to return in the future. We've fallen in love with Venice and your perfect little home. Grazie! My 6th time to Venice and each time it is like the first time. This location and this apartment by far the best experience. The courtyard with the canal view, our own private piece of Venice. I love the tranquility of the canals...thank you! Wow!! What more can you say? An amazing apartment right in the heart of it all. Easy to get to and so very comfortable. There is not one detail that has been overlooked...we would love to return one day! Thank you so very much for allowing us to spend a week in your beautiful home. We shall return and for a much longer time! Words cannot express our gratitude to you and the time spent here. Thoughtful details, special touches, and great warmth made Ca' Venexiana the perfect "home" for us in Venice...We greatly appreciated your hospitality and assistance in making our trip so special. You have created a special niche in the heart of Venice. Thank you so very much for sharing it with us. from their travel blog: We rented an apartment (Ca’ Venexiana) surrounded on two sides by canals…like the coolest corner lot you can imagine…in Venice’s lesser-traveled Dorsoduro district, a quiet area of the city we came to love. It wasn’t uncommon to be enjoying a glass of wine in the kitchen while a gondolier rode right past the window. A truly magical spot. We loved Ca'Venexiana and thought it was the perfect location! We wanted something away from the crowds, yet convenient and comfortable. Your home is lovely! The way you've decorated it and the fact that it doesn't want for anything makes it a wonderful home away from home. Congratulations on your perfect jewel in Venice! Three of us stayed here in May - the apartment was everything we wished for - quiet but in a great location, waterside outside dining area (we had a small cocktail party for friends), convenient for restaurants and shops. The information before we arrived was very useful, and we were met by a representative who was very helpful. We loved sitting out in nearby Campo San Barnaba and Campo Santa Margarita. The apartment was very well appointed, with lots of useful recommendations in the guest information and visitors book. Would love to go back! We had a delightful holiday in this beautiful apartment on the canal in Venice. The apartment was tastefully decorated and clean and secure. The owner was most helpful all the way through the booking process and we were met by her representative in Venice who had good local knowledge and was always contactable. The apartment was in close proximity to all Venice's main attractions and yet pleasantly quiet in the outskirts. It was also close to the vaporetto stop... I would recommend the apartment to anyone wanting to explore Venice, and would love to go back myself if I have the opportunity some time. Ciao! An excellent apartment, location and wonderful introduction to Venice. Brilliant communication from the owner Jackie, superbly appointed and the terrace and passing gondolas were a treat for my wife, my son, his fiance and myself in September 2010. Give yourselves a treat and stay in a 'real' Venetian home with local wine and prosecco available just a couple of doors down the street. You can walk to Rialto, St Mark's Square, The Frari and Accademia in no time at all and buy your jewellery at Attombri's near the Rialto bridge. We loved the location and being away from the busy area around St. Mark's. Your apartment is decorated so nicely and the bathroom is wonderful! We thoroughly enjoyed our stay there and would highly recommend your place for anyone looking for a place to stay in Venice. We had a great time in Venice and really enjoyed being able to stay in your apartment - which is truly lovely. Sitting on the terrace with the doors to the canal open for breakfast and later in the evening was a delight. What a fantastic apartment. We spent 6 weeks touring Europe and this was our favourite accomodation by far. I wish I were there right now! The apartment is a credit to Jackie. She has thought of, and caters for, every aspect of what is required to make it an ideal base for your stay in Venice. The decor is really beautiful, classy and welcoming. There are board games, dvds, computer games and a heap of English language satellite tv channels to keep you entertained if you want to stay in (which was great for our boys). There is a incredibly well-stocked little library with an absolute wealth of information about Venice (guide books, novels, coffee table photography tomes, etc). The kitchen has everything you could possibly need. Jackie is obviously passionate about Venice and about providing her guests with the best opportunity to enjoy their stay. We could easily have stayed for weeks! We had a wonderful stay at Ca'Venexiana and to anyone wondering if this would be a good place for themselves and family to stay - I would say book it NOW - don't miss out. It felt like a luxury home not a flat - it was a pleasure to stay for our family. We spent 3 nights here in mid Oct 09 and it was wonderful! You could not ask for a better location in the entire city as you are just outside of the crowds at St Mark's but close enough to get in the midst of everything within a few minutes walk. Beautiful interior with everything you need and of high standard. Very professionally ran and handled from booking to meeting us at the flat. Will definitely look to stay here again my next visit to Venice. This is the type of apartment that makes you write a review to tell the world how nice it is. I have stayed in many apartments across Europe, and this type of apartment is really the future: the hotels will be a thing of the past! The amenities of the apartment are unbelievable. We travelled with children, and they even found a gamecube to play, lots of Tv channels, internet for us! The information was incredible: books, guides, a book with all the apartment information...there were umbrellas, hats, and even something to cover my shoulders in churches!!! I hate it when I arrive at one apartment and there is no cleaning stuff. Here you find everything: detergent, dishwasher tablets, bin bags...you don't have that feeling that you have to spend a fortune in the supermarket to be comfortable (as we had to do in our previous holiday home in Tuscany). The apartment also has all the basics for cooking: olive oil, vinegar, salt spices, coffee, tea, sugar. For me there are 2 types of apartments: the very basic ones and the ones where you feel you have borrowed someone else's home. This is how you feel at Ca Venexiana, at home. I must also said that it has been tastefully decorated to the last detail. Even the table lamps had Amercian sockets, this means that someone who is capable of crossing the Atlantic with lamps to decorate is putting loads of attention to the last detail, or at least that was my conclusion! In fact I must say the the photos of the advert are the worst part of it, as the reality is far better. The views to the canal were amazing, just sitting outside having a coffee feels a real Venetian experience. The location is also very convenient. You are close to attractions but not in the middle of the tourist center. It is a pleasure to walk along the streets of Dorsoduro. We really enjoyed Venice and the city impressed us very much. There was a waterbus stop, a supermarket, restaurants and shops very near. Congratulations for the great job done in this apartment! We love your place. Everywhere is close and we had great time with our best friends-family. Wszystkim polecam - warto oderwac sie do rzeczywistosci! Wszedzie blisko, apartament zrobiony ze smakiem, a patio na wieczory z campari super. I just want to write to you and say that you have the most wonderful apartment in Venice, and you really have gone out of your way (and succeeded) in trying to make a home from home. The flat has everything you could wish for, and it is all so tastefully put together. We have stayed in flats all over Europe, and this was the best by far. Absolutely. Your apartment is so beautiful and what a location! To sit in the garden and have a gondola glide by as you are sipping prosecco is priceless! We were lucky enough to have good weather so we utilized that area every evening after long days out exploring Venice. Your book of tips with the markets, cafes, etc. was a perfect guide. Everything was perfection! Thank you for letting us stay in your lovely apartment. We had a fantastic 5 days and absolutely loved Venice. The Dorsoduro is our favourite area in Venice so far, we found it a welcoming calm oasis after the hectic crowds in San Marco. We especially liked the fish and grocery markets and managed to cook up a storm in your well equipped kitchen! We saw most of Venice but made sure that we left a little bit so we can come back again! We look forward to visiting Ca' Venexiana again soon! 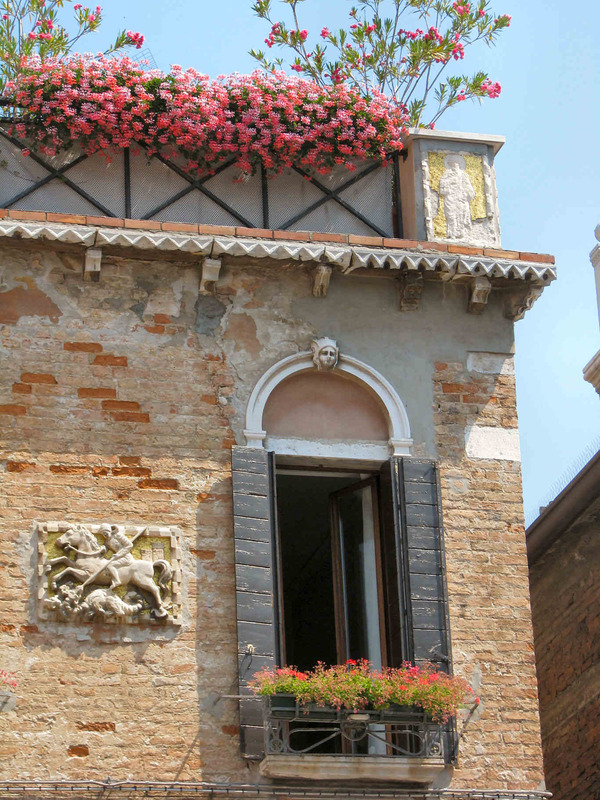 Ca' Venexiana is the perfect place to stay in Venice! It's got the feeling of being at home but with all the comfort and amenities of a hotel. The property was clean, well maintained and caters to every bit of guest's comfort. It's location is also very convenient to all the tourist destination in Venice. We really enjoyed our stay at Ca' Venexiana, in fact, my children didn't want to leave at all! I highly recommend the place, it really exceeds your expectations! Would you like to be included in our online guestbook?